GrandPrix dot com puts in a word in support for the Donington Park GP today, pointing out that most of the doubt regarding Simon Gillett's plan emanates from the media. Other quarters are quite optimistic, apparently, and the article suggests that we remember that everything has run according to schedule so far before being too critical. I have had little to say on the subject except that I remain doubtful regarding the finances of the operation. 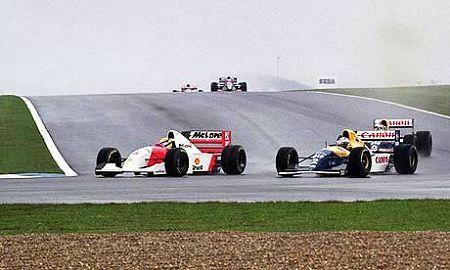 In all other respects, I will be very happy if Donington is ready to host the British GP next year - and yes, I remember the race in 1993 and Ayrton Senna's demonstration of complete superiority on a damp track. It is a good circuit and the planned alterations should make it even better. The problem is that paying for the new track and facilities has always looked beyond the resources of the owners. Their debenture scheme seems pie-in-the-sky, especially in the midst of a recession, and the rumors regarding financial problems continue to get stronger. F1-Live is currently running a story alleging that both Lee Gill and Tom Wheatcroft are suing Gillett for unpaid debts. Of course, it is the media, so perhaps I should ignore this. The fact that it is based on a reading of Donington's accounts for 2007 does give it credence, however; the operating company is in debt to the tune of millions it is claimed. Who are we to believe? Max and Bernie may be upbeat about the scheme but they do have vested interests, having brought to an end F1's relationship with Silverstone. Max needs the British GP to continue because the fans are already bemoaning the loss of F1's classic races, but Bernie could not actually care less, convinced as he is that some Asian race can be slotted in if the Donington GP proves impossible. The planning authorities, having put their seal of approval on the scheme, are bound to want it to succeed. It is true that initial resistance to the plan was the result of disappointment at the loss of Silverstone. For over fifty years the Northamptonshire circuit has hosted the GP and it is not easy to wave goodbye to such tradition and history. But I think most are over that now - there was never anything we could do about it anyway, given Bernie's determination to be rid of its awkward owners, the BRDC. In fact, the vast majority of F1 fans are in favor of Donington meeting its commitments; they are all aware that, if Gillett does not get the race up and running, there will be no British GP at all. Donington receives a lot of goodwill as a result and it is a shame that better answers are not given to the financial questions asked. If there were no reason to doubt, surely Gillett would have set our minds at rest by now? Well, Mr Gillett says that he will tell us about the finances next month. Hopefully, this will prove how wrong the media's criticisms have been and we can look foward to a great British GP in 2010. I must admit that I will not be holding my breath, however. It is all well and good to claim that he is on schedule so far but he hasn't had t spend real money yet. He got planning permission faster than I thought he would but he has not raised the money for the construction. He may have bulldozers operating now but how much longer can he keep them going? His debenture scheme looked crazy when it was announced and the changes to the world financial climate since make it even crazier. The fact that the original board has split cannot help things either whether or not he is being sued. You cannot plan a project like this and then have on of the two partners drop out without it having some effect. My view has neve changed. There will be a British GP in 2010 at Silverstone just as there was a British GP at Silverstone when Brands Hatch won the contract. Mr Gillett will pay a default fee to Bernie to get out of his contract. Silverstone will be suitably chastened and the world will continue to spin on its axis as nothing will have changed. Clive: As you quite rightly state, Formula one is big business and largely centered in England - where accordingly it plays a significant role in the local economy. Bernie’s threat to trash-can the British GP is exactly that. Why? Merely an effort to extract money from any deep pocket that would suffer from such a cancellation. Like who? Let’s start with the government - and why not, it’s certainly today’s most popular option of choice. Where did I get such a crazy notion? His recent effort to extort money from Canada’s governments to save the Montreal GP. Unfortunately for him (unlike England), Canada did not have anything beyond the actual GP to lose - and that event was already subsidized. I wonder if Max's comments about sporting authorities and traditional races was a hint that the FIA would come to the rescue of Silverstone. Like you, I wonder if all is as it seems with the Donington deal. If Silverstone couldn't make money out of it, how is Donington going to, given the cost of upgrading the track. Wouldn't surprise me if Bernie is playing games again, just as he did with Brands Hatch. David: I think Bernie is barking up the wrong tree if he thinks the UK govt. will ever put funds into F1 in any way, including a British GP. His strong arm tactics don't work with them because they know that F1 fans are a minority in their electorate. And who expects govt. to think ahead economically? F1 may actually bring in plenty of money to the country but govt. prefers to put money into things like banks that are visibly failing. Patrick: Agreed. Donington is a great circuit and I would love to see it host a GP again. I'll have to see it to believe it, however. I'm beginning to wonder if Max and Bernie aren't secretly working together? If F1 becomes a spec series as Max is pushing so hard for, the manufacturers will leave, and Bernie can argue that the privateer teams remaining don't need so much of the take since the costs will be so much lower. With the manufacturers gone, no one will pressure Bernie to retain the classic venues and he will be free to pursue the money to wherever. It seems the French government is caving in to his demand to build a circuit near Paris, and now I read that Tilke is doing a survey in Rome with an eye to running a street race there. If that happens, what of Monza, which is already under some pressure from the Greenies? I admit to feeling a bit gloomy about the future, because I think part of F! 's appeal is that they still race where Fangio, Moss, Clark etc raced. I would say that resistance to the abandonment of old circuits is getting stronger, Lonny. A couple of years ago, the fans were the only ones protesting when great circuits were axed but these days even Max is saying that the classics must not go. Bernie is making himself very unpopular and might be forced to see reason in the end.